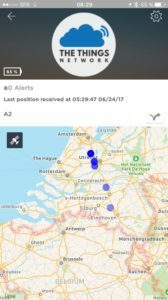 GRENOBLE, FRANCE, June 26, 2017 – HidnSeek is announcing its first LoRaWAN™ product using The Things Network to link physical assets to the digital world. The new asset tracking standalone GPS module is available for European range (868MHz). HidnSeek ST1-L for LoRaWAN™ is a low power and rechargeable tracker backed by smart services enabling real-time, widespread, geolocalisation, temperature logging and motion detection. The tracker hardware is customizable with further sensor integration allowing the deployment of new services. The Things Network is on a mission to provide the world with free Internet connectivity for things and it started in Amsterdam. The Things Network is a global community of 19129 people over 89 countries building a global Internet of Things data network. The Things Network uses a long range and low power radio frequency protocol called LoRaWAN™.